An Unguarded Malala Is The Perfect Talk Show Guest : Goats and Soda Some critics say the new documentary about the Nobel laureate is inspiring but doesn't offer enough candid moments. Fortunately, Malala herself is very open — and funny — on the talk show circuit. 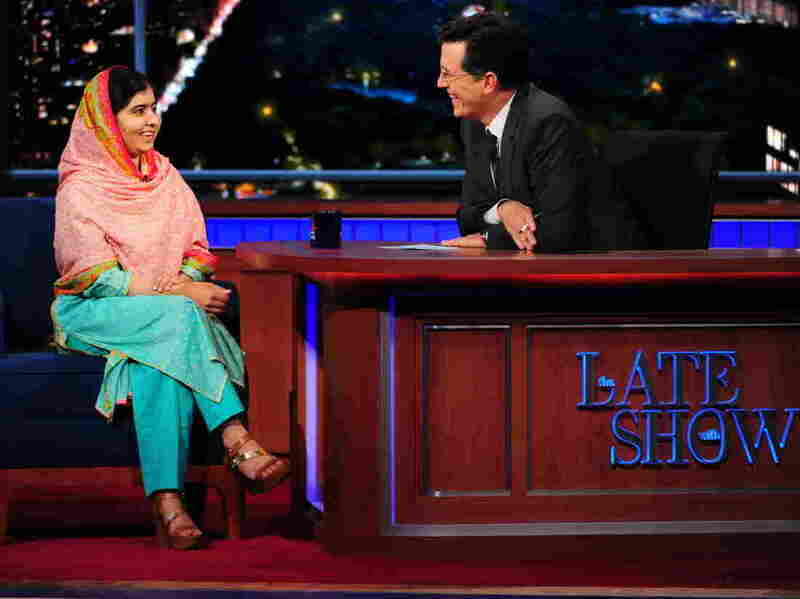 Nobel Prize Laureate Malala Yousafzai tried to read Stephen Colbert's mind on The Late Show. In October 2012, Malala Yousafzai was shot in the head by the Taliban for advocating for girls' education. She marked the first anniversary of the attack by releasing her memoir, I Am Malala. A year after that, she was named the youngest Nobel Peace Prize laureate ever. This month, the 18-year-old becomes a movie star. Director David Guggenheim (Waiting for Superman, Inconvenient Truth) tells her story in his latest documentary, He Named Me Malala. Although the subject is inevitably inspiring, reviews have been mixed. Writing in the L.A. Times, Rebecca Keegan said that the movie takes "viewers inside Malala's world, to feel her joy, trauma and ultimately forgiveness." But in The Guardian, Catherine Shoard writes, "It is all but impossible for such a study to not stray into hagiography, and Guggenheim doesn't really put up much of a fight." And New York Times critic Neil Genzlinger observes: it only occasionally delivers the kind of unguarded moment that makes you feel as if you're getting beneath the media image." Fortunately, Malala delivers plenty of unguarded moments when she speaks to the public. The audience at the Telluride Film Festival was treated to a personal glimpse last month during a post-screening Q&A session with Malala, who was beamed in from Birmingham, U.K., where her family now lives. Asked about her nearly perfect scores on her high school exams, she told a stunned audience: "It was the happiest day of my life when I got my results. Yes, I have a Nobel Peace Price, but this time I felt I really achieved something through my hard work." Here are a few other classic unguarded Malala moments. "If he comes what would you do, Malala? Then I would reply myself, Malala, just take a shoe and hit him. But then I said, if you hit a Talib with your shoe then there would be no difference between you and the Talib." "Do you still think it's as beautiful as New Jersey?" "I wanted to speak up for my rights. And also I didn't want my future to be just sitting in a room and be imprisoned in my four walls and just cooking and giving birth to children. I didn't want to see my life in that way." "I was really worried about my height, and I said, like, I'll never grow up and I'm never going to be taller. Now, when I look at my height God has given me, I was asking him only for 2, 3 inches, and he just made me as high as the sky. And now on that much height, I can reach people. I'm — like, reaching you is the greatest height. It's the greatest height." "So I was in my chemistry lesson in school and just studying about atoms and those things and suddenly my teacher came in she surprised me she said that you have won the Nobel Peace Prize. And I said, OK and then I said, I want to finish my school. And cause I am standing up for education and I have been given this award because I am fighting for children's rights to go to school so I deserve this right to study today in school. Finish my school day and then I'll go and have press interviews and stuff. So I finished that day." This week on The Late Show with Stephen Colbert, Malala proved she really has the magic touch — by doing a card trick. "So this really is about reading mind. Yeah, and I know what's going on in your mind," she said while shuffling the deck. When he responded, "Not much," she joked back, "I can see. I haven't heard anything yet."